Kids bed tents for boys and girls are fun bed toppers that kids will love to play in and sleep in, too. They provide a cozy nest to hide away in, and give some children a feeling of comfort. 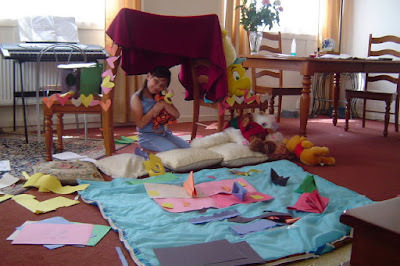 Play tents can provide hours of fun, imaginative play. I had trouble getting my son into bed sometimes when he was little. It was too much fun to keep playing. However, when we purchased him a bed top tent, bedtime became fun time, too. He would zip himself up inside the tent and feel snug and safe, though on occasion, he would get fingers pinched or clothing caught in the zipper. That's not an issue with the tree house bed tent pictured above, because there are no zippers, only Velcro closures. It works well for boys or girls, and lets kids 'sleep' in the trees every night. It features a removable poly-cotton washable twin sheet, Velcro tabs to secure the tent to the included bed sheet, mesh windows, and a curtain door. The tent is constructed of 70 denier, 190T polyester taffeta and has a PU coating. To clean the tent, just use a damp cloth with mild soap. It fits all standard size twin beds. And it is so easy to put together, kids can do it. Camping in a Bed Tent! For a bit of added fun, give your children an electric camping lantern or a flashlight, so that they can play like they are camping in the woods. A playtime sleeping bag would be a hit, too. Some parents report that having a bed tent helps kids transition to their own beds more easily. Others report that in the summer, it can get a little hot inside. A stand fan blowing into the roll-up window would help with that. These cute tents are a far cry from those we had when I was a kid. We had to make our own using sheets, twine, and clothes pins. It was fun, but I think this one would be even more fun. It is so important to give kids a feeling of safety and the fun aspect doesn't hurt a bit. Both boys and girls enjoy having a tent for their beds. Our daughter had a bed play tent, too. Hers had Disney Princesses on the tent fabric. Instead of having adventures in her tent, though, she took her books, dolls, and a flashlight inside it and read to her dolls. She enjoyed spending hours reading the 'bed-time' stories to her dolls. The tent was also her go-to place when having a little brother became more bother than she wanted to deal with. but not so fun to take back down. Bed tents can be built using sheets, twine, and clothespins, if you don't have a store-bought bed tent. When my siblings and I were children, we often used chairs and bed frames as the 'bones' of our tents. Sometimes, we would make entire room tents. We would tie corners of sheets to various stationary objects around the room, then find something that stood tall to be the center tent post. The hall hat rack or a broom propped between two chairs worked great. It was always lots of fun to build them and play in them. It wasn't as much fun to take them back down when the chairs were needed for a meal or Mom needed the broom to sweep the floor. When my children were small, before we purchased their bed tents. we would occasionally drape a sheet over a card table for them to have a small tent to play in. My daughter would play house in the tent. My son would play fort in the tent. Or they would make play money and have a store. They both enjoyed it! 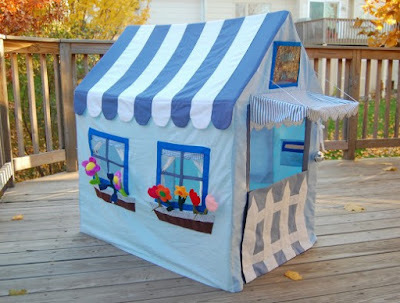 Did you build play tents when you were little?